Our two distinct product lines — FWM Docks and EZ Dock — make it easy to create the custom boat dock system of your dreams. 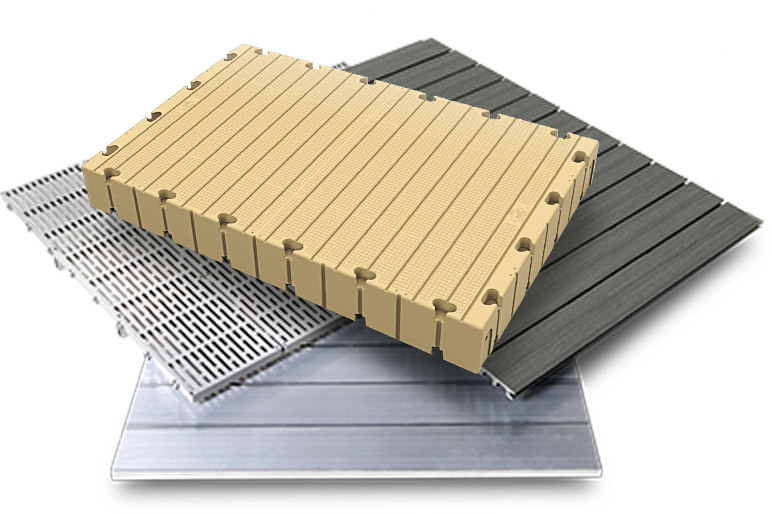 We manufacture a variety of decking surfaces to customize the look and feel of your FWM Dock, which is crafted from lightweight aluminum for easy installation and removal. Our rugged, polyethylene EZ Dock systems are so tough that in most cases they can be left in the water year round. Both are designed with commercial flotation capacity and built to last a lifetime. Our two distinct product lines — FWM Docks and EZ Dock — make it easy to create the custom dock system of your dreams. Choose from a variety of decking surfaces to customize the look and feel of your FWM Dock, which is crafted from lightweight aluminum for easy installation and removal. Our rugged, polyethylene floating EZ Dock systems are so tough that in most cases they can be left in the water year round. Both are designed with commercial flotation capacity and built to last a lifetime. Built with a heavy-duty modular aluminum frame, our aluminum floating docks provide an endless number of dock system configurations to meet your wildest waterfront needs and can be shipped anywhere nationwide! FWM Docks is the Northeast’s premier distributor of the EZ Dock Modular Dock System. Made from heavy-duty polyethylene, EZ Dock’s unique floating dock sections are modular, stable, safe and durable.